Chronic digestive problems are often a sign of irritable bowel syndrome (IBS), but sometimes other undiagnosed conditions are the real cause. Research suggests that people with an accurate diagnosis of IBS could benefit from taking peppermint oil. IBS is a common digestive disorder marked by abdominal bloating and discomfort, gas, and loose stools or constipation, or episodes of each. Its cause remains unknown, but stress appears to be an important contributing factor. The typical treatment recommendation is a fiber supplement, but sometimes other medications such as antispasmodics and antidepressants are prescribed. Some people benefit from these therapies, but many people with IBS continue to suffer chronic digestive discomfort. Because symptoms of other digestive problems are so similar, the IBS diagnosis is overused. Studies have found that anywhere from 5 to 50% of people diagnosed with IBS actually have another condition that could be responsible for the same symptoms. Lactose intolerance (the inability to digest the sugar found in dairy foods), small bowel bacterial overgrowth, and celiac disease (an immune reaction to gluten) have all been identified in people diagnosed with IBS. Unlike IBS, there is a clear treatment path for each of these conditions. The latest study included only people with IBS in whom other conditions had clearly been ruled out. The participants took either 450 mg of peppermint oil, prepared in enteric-coated capsules (designed to dissolve in the intestine rather than the stomach), or placebo two times per day for four weeks. At the end of the trial, 75% of the people in the peppermint group reported a 50% or greater reduction in IBS symptoms, and four weeks after finishing treatment almost half of them were still feeling better. By contrast, only 38% of those in the placebo group reported a similar reduction in symptoms at the end of the trial. The volatile oils that give peppermint its distinctive aroma have antispasmodic and antibacterial properties that could account for some of its benefits in people with IBS. It has been used historically to treat colic, indigestion, and gas. 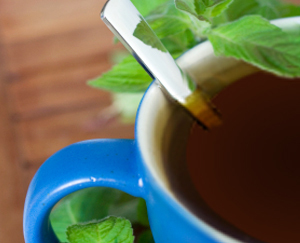 Peppermint can aggravate heartburn, but for most people the enteric-coated form is safe in this regard.